It goes without saying that the road to success is often paved with failure, rejection and discomfort. We often get told that success only comes to those with clear goals and high spirits. However success can be likened to a child. Children can never walk before they crawl and run before they walk. Well, success is pretty much more or less the same. More often than not, when successful people tell their side of the story, we only get to hear about their public glories but not the sacrifices they took in accomplishing their dreams. If you think the road to success is easy to navigate, then you still have a long way to go. We need to comprehend that we will never reach the ‘Promised Land’ if we do not incur a lot of disappointments and setbacks along the way. Perfection is indeed unattainable but if we work hard chasing it, we can get excellence in return. Success is not for the faint-hearted. Life will knock you to a different level. You first need to start taking criticism constructively. Success will eventually come after you start overcoming your fear of failure. It is about time you start embracing adversity with both hands. 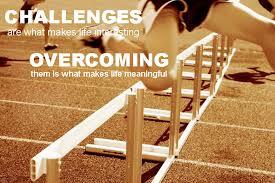 Everybody who has ever been great has had a barrier to overcome. If you continue to keep pushing and keep pressing harder, I can guarantee you that one day it is going to be your day. Remember that it is the pain that sets the prize. There will be times where you won’t make ends meet, where you won’t feel like waking up in the mornings and days where you won’t feel like facing the world. However, I am here to tell you that that is when you are going to start living your life on a new level and seeking out new horizons without any fear of failure. If you can outlast those discomforts or disappointments and remain focused on your goal, no burden of any kind will overwhelm you. Nothing is as endearing as achieving greatness knowing that it was attained through your own hard work and dedication. But in order for that to happen, you need to start changing your perception about adversity. If you never experienced any setbacks or failures, what will make your success story inspiring and meaningful? How can you experience triumph without defeat? Even Einstein once said, “ Anyone who has never made a mistake has never discovered anything new”.